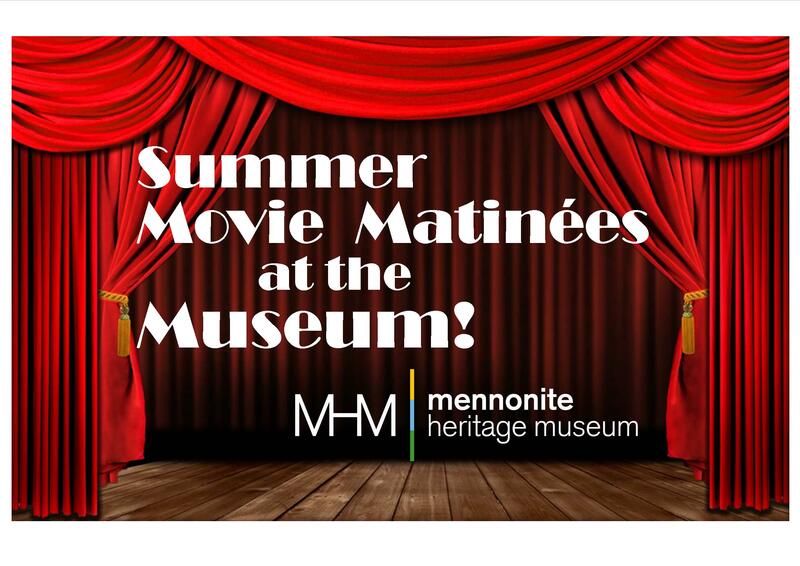 For our 2018 Free Summer Movie Matinee Series we are offering one feature each week. Check back for updates! Call 604-758-5667 to register for the movie you are interested in watching. When you come to watch the film, stop by the reception desk and pick up your ticket. Hand in your ticket to the usher at Theatre 2 in the main exhibit. Seating is limited to 25 viewers. Please enjoy a visit the coffee shop between 10am and 3pm; please keep food and drink in the cafe seating area. No blocking aisles, the door, or moving chairs. This is for safety reasons. Chairs have been set up for everyone to have the best viewing opportunity. Lights cannot be completely turned off for emergency safety (many theatres have floor lighting, we do not). We will very gladly schedule a select showing at another time if the film is popular and creates a waiting list. If the film is short enough, we will plan to run it again shortly after the 1pm showing is finished. If it is too long, we will run it again in the morning. Please be respectful of reserved seating and allow those with tickets to be seated first. 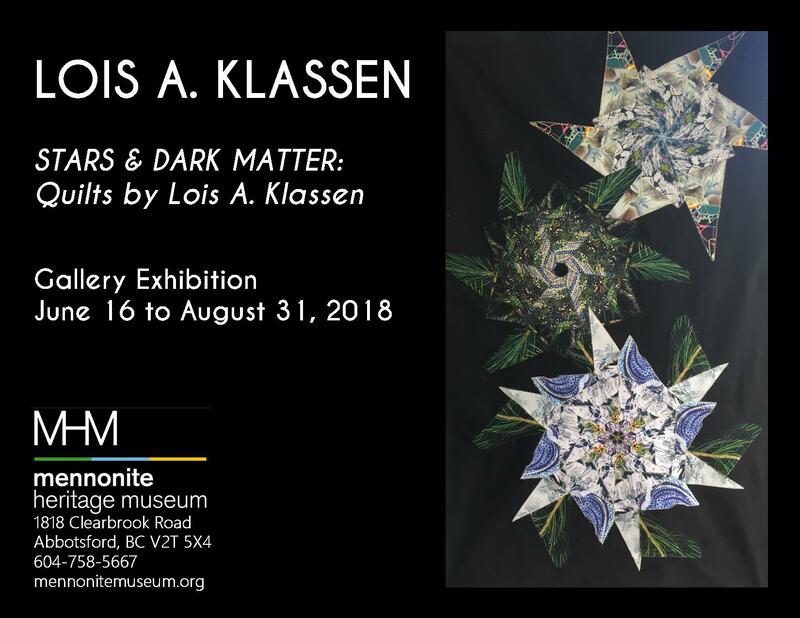 If there is room, museum visitors who are not registered may be seated as well. Seating is limited. Please sit so that there are no gaps in seating to accommodate the most viewers. We want everyone to have the best experience; please be considerate of your fellow movie watchers. See the usher if you have any questions or concerns. Details on links provided, where possible. 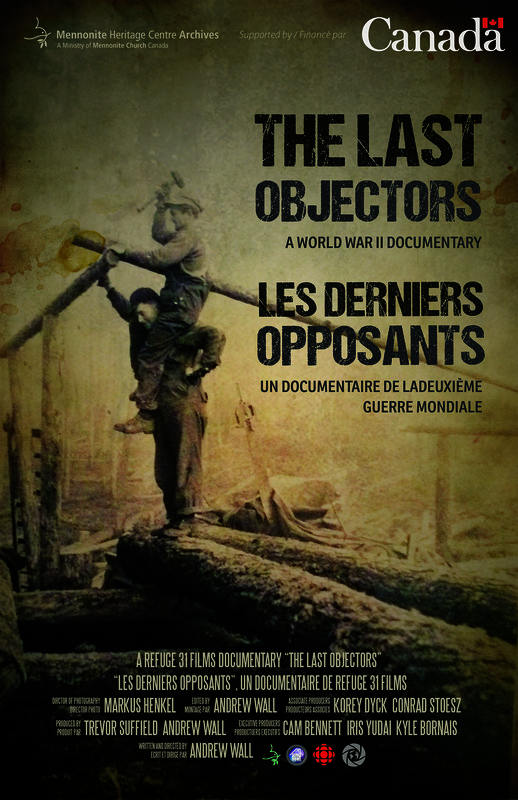 The Last Objectors is a TV-Hour (45 min) documentary on Canada’s conscientious objectors of the Second World War who chose to perform alternative service instead of going to war. They would spend years working in forestry camps, hospitals, asylums and various other positions throughout the country with little pay and no benefits. A Refuge 31 film. Mennonite Heritage Centre Archives. oppression. This film features vintage motion pictures never seen outside the Soviet Union and offers dramatic stories of survival that have remained locked away for more than a century. An Agile Arts production/Mennonite Historical Committee Presentation. they originally took place. Produced by Exodo imagens/Fundacao Educacional Menonita. 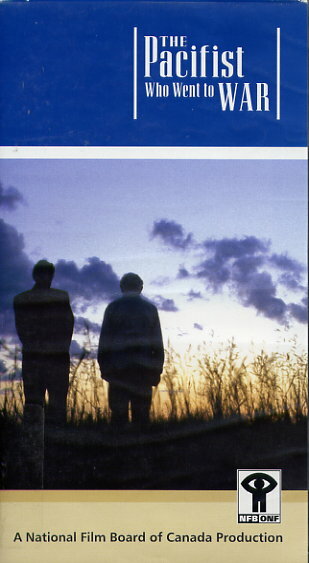 A German-language film with English narration about 50 years of Mennonites in Fernheim, Paraguay, 1930-1980. 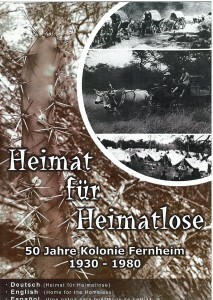 This film contains information regarding how life might have been for the Mennonites in Gran Chaco. There is a discussion of how the Mennonites arrived at their assigned location with an explanation of conditions and hazards of their newly inhabited land at the time. There is also some brief background history regarding the Russian Mennonites in order to explain their experiences prior to, and following, the Bolshevik war. A Dueck Film Production. in a small village in the Mennonite Khortitsa Settlement. Winnipeg film-maker Otto Klassen uses rare archival photographs and film footage from the German Bundesarchiv to document the westward retreat of over 350,000 Soviet-Germans and Mennonites in the fall of 1943, their resettlement in German-Occupied Polish territory, and their eventual flight from advancing Red Army forces in the early months of 1945. Otto Klassen tells the story of these terrible years from his own personal experiences. 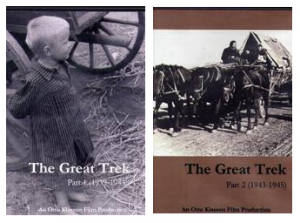 Peter and Elfrieda Dyck portray refugees’ trek in 3 segments on this video. Berlin Exodus (60 min), shot in a church in Nebraska, is a one-hour telling by Peter Dyck of the miraculous escape out of the Russian sector in Berlin. Gott Kann, (30 min.) 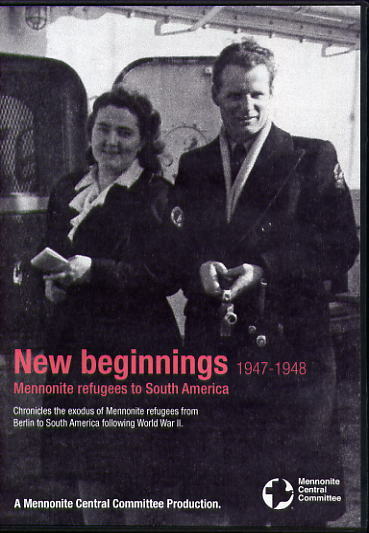 follows the first group of Mennonite refugees out of Berlin on the first transport, the Volendam, and to Paraguay. New Beginnings, (30 min.) shows the three subsequent transports to South America, including the Prussian Mennonite landing in Uruguay, and the hard pioneer beginnings in the new land. colonizing in Mexico. 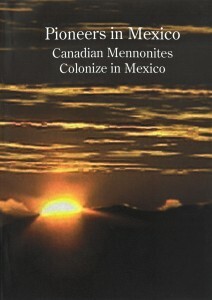 This documentary explains the history of the Mennonites who immigrated from Canada to Mexico in the years 1922-26. This focuses specifically on the various types of work involved to establish a successful community in a vastly different land than they had previously been accustomed to. Main topics include: transportation, mechanization, farming and harvesting crops, adaptation to an unfamiliar climate and more. 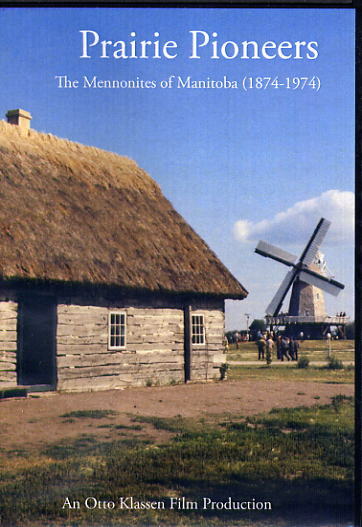 celebrations in Altona and at the Mennonite Village Museum in Steinbach. Church or nation? That’s the question at the heart of the documentary The Pacifist Who Went to War, portraying Mennonite communities in Manitoba who, seven decades ago, were forced to choose. Either fight in the Second World War, as their government asked them to, or stand up for their religious beliefs, calling for peace and non-violence. Director David Neufeld focuses on two brothers, John and Ted Friesen, both eligible for combat. John enlisted, feeling a responsibility to defend his country, while Ted became a conscientious objector on religious grounds. “Our traditional view was always that war was completely incompatible with our belief,” Ted tells the camera. But while the brothers are at the centre of the story, the film pans out, tracing the history of Mennonites who first came to Canada with the promise of military exemption. That exemption was lifted at the start of the Second World War, and many of them — like Ted — became conscientious objectors, forced to work on home soil for the duration of the war to build roads and work in hospitals and mines. Of the 10,000 conscientious objectors in Canada, 7,000 were Mennonites. The film lingers on the fight they encountered by upholding their religious beliefs. They weren’t alone in their struggle: the men who went to war faced stigma within the Mennonite community upon their return home. For older Mennonites, it’s a wound that has never quite healed. At the same time, the film shows that younger-generation Mennonites are no longer learning the same lessons of pacifism that so clearly made an impact years ago. Neufeld’s documentary offers a fresh take on a war that feels like it shouldn’t have any fresh takes left. The film is straightforward but the story is not, and the decisions those men made are still reverberating through their communities today.